Minami is an upscale Japanese restaurant in Yaletown that specializes in aburi style sushi, which is flame seared sushi with special sauces. It is the sister restaurant to the popular Miku restaurant that also serves the same style of sushi. My family brought me here for my birthday dinner because I had a great experience at Miku and I’ve been wanting to see how this location compares. I actually like the ambiance here at Minami a bit better. The decor has a warmer feeling and it isn’t quite as loud. There is a charge for tea here and they have both a green tea and a jasmine. I went with the green tea and it comes in a cute little personal size pot. 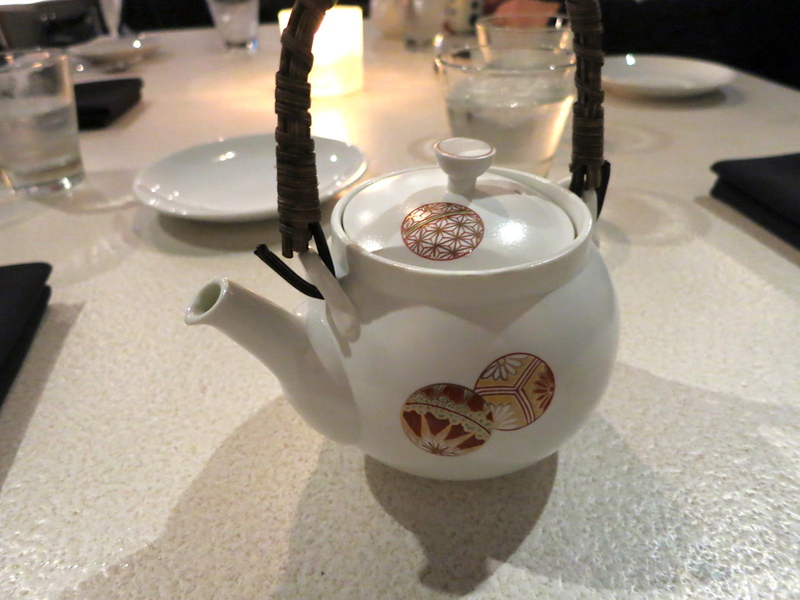 The tea had a clean, earthy flavour and it went well with all of the food. 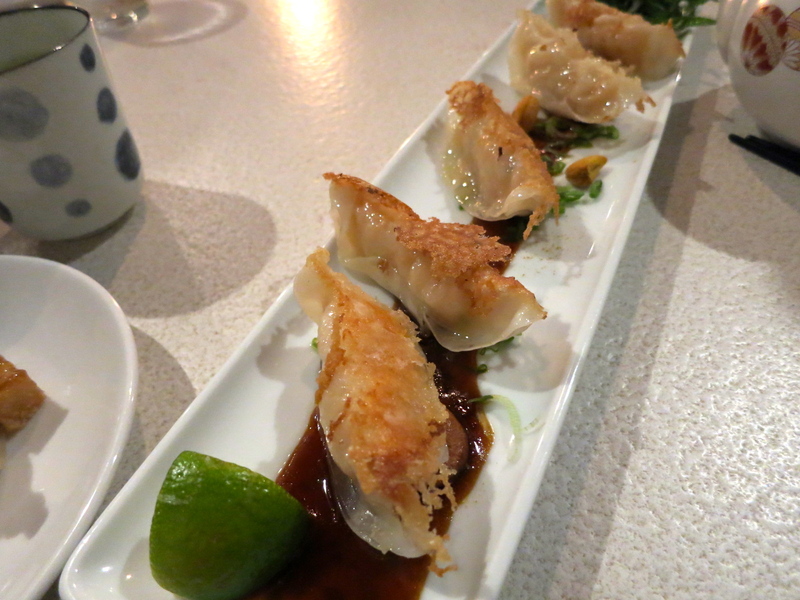 The shrimp and crab gyoza ($14) were covered in a sweet soy sauce, garlic chili oil, scallions, and spiced cashew nuts. 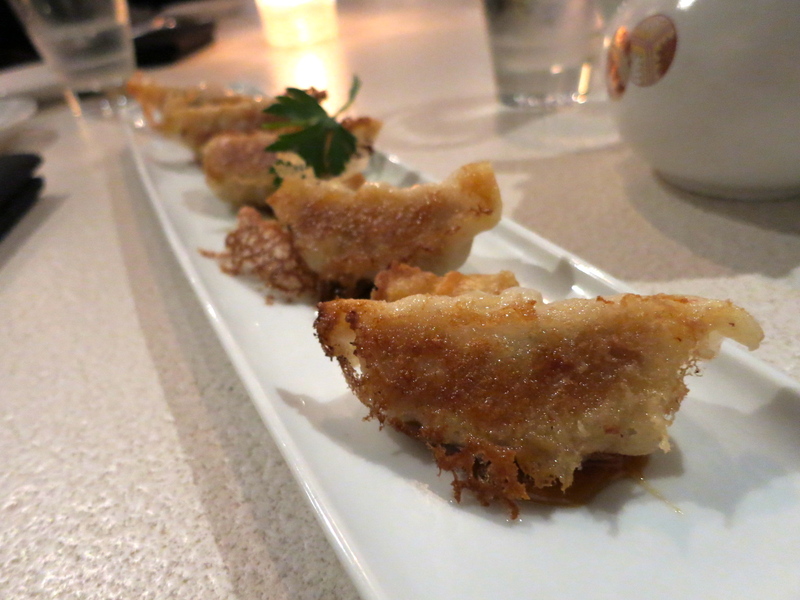 I loved these gyoza and they are some of the best I’ve ever had. The gyoza wrapper had a thin, ideal, texture. Good gyoza have to be crispy on the bottom and these definitely were. The shrimp and crab inside had a sweet seafood flavour. The sweet soy sauce and garlic chili oil made these gyoza extra yummy. The spicy pork gyoza ($13) are served with a drizzle of chili oil, soy, and vinegar. Little pieces of crispy pork belly accompany them on the side. These gyoza had the same thin wrapper and nice crisp texture. The filling of these was good and it had a hint of spice, but I enjoyed the crab and shrimp ones more. 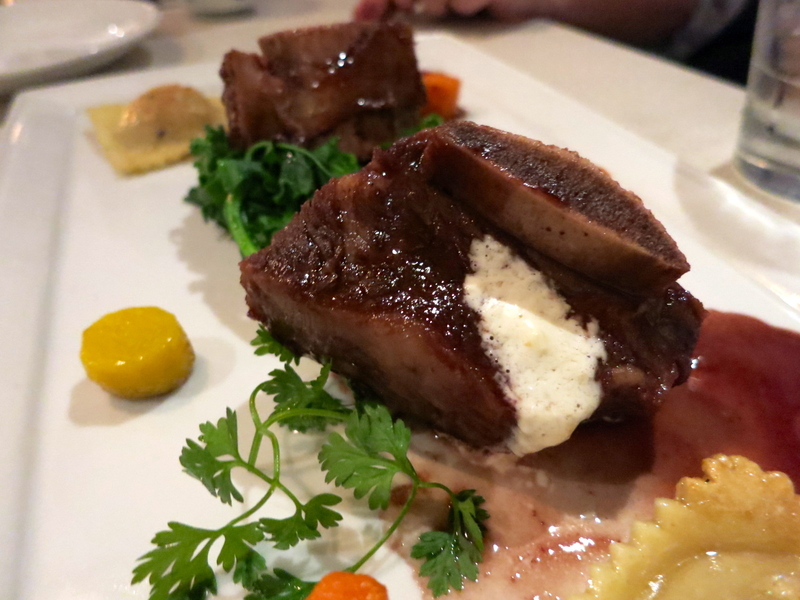 The soy braised beef short rib ($28) comes with a horseradish crème fraîche and a red miso-pinot noir reduction. It is served with jidori chicken and foie gras ravioli and a few vegetables. The beef short ribs were small in size, but amazingly tender. Being cooked and served on the bone gave the dish a really meaty flavour. If you aren’t big on sushi, this is a great meat dish. 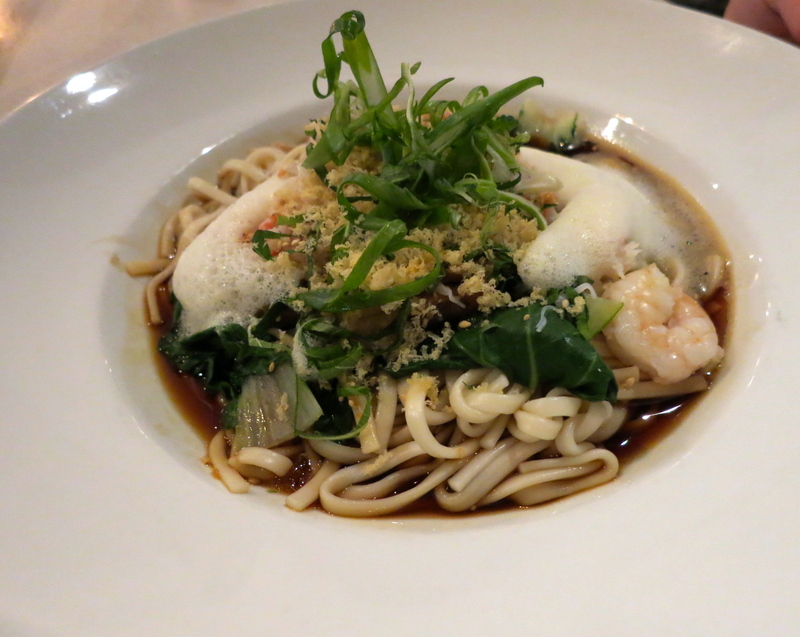 The snow crab and shrimp udon ($18) is served in an umami dashi and is topped with scallions, sesame, shiso leaf, baby bokchoy, tempura bits, and miso foam. The noodles were nice and chewy and the broth was salty, rich, and savoury. Although you can’t really tell from the picture there was actually a decent amount of crab meat in the bowl. 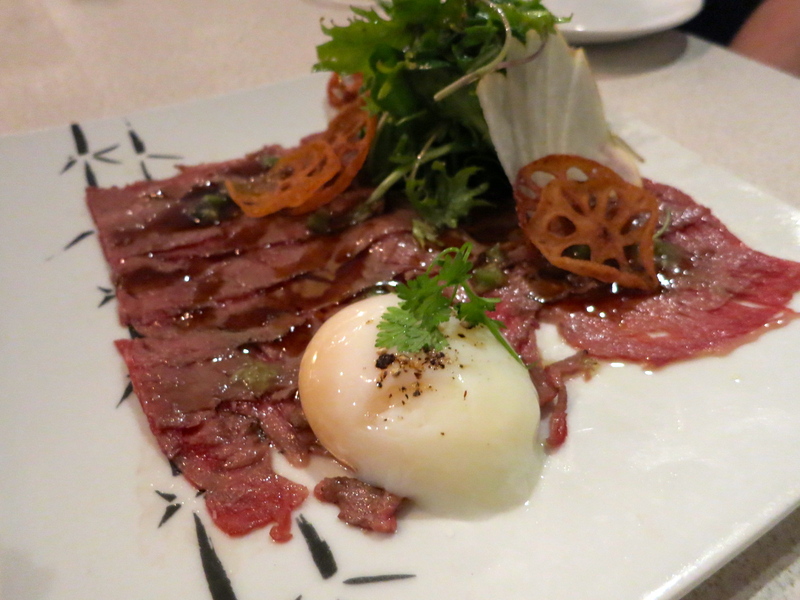 The aburi carpaccio ($16) is served with a 64 degree egg, asian pear, greens, lotus root chips, wasabi pickles, and jalapeño-garlic ponzu. I think this is the best carpaccio I have ever had. The meat was melt in your mouth tender and served a beautiful shade of pink. I love how 64 degree eggs seem to be popping up more often in restaurants. Once you pop it open and the golden yolk oozes everywhere, they add an indulgent, creamy element to the dish. The asian pear, lotus chips and greens added some contrasting textures, flavours, and freshness to the dish. The sunset roll ($16) is filled with spicy tuna and cucumber and it is topped with smoked salmon, golden tobiko, kaiware (daikon sprouts), and a mustard sauce. While this roll was fresh tasting and good, it wasn’t exceptional. I mostly just tasted smoked salmon, which I like, but the other elements didn’t stand out. I feel like it this something you could find in any nicer sushi restaurant and it’s not worth the money here. 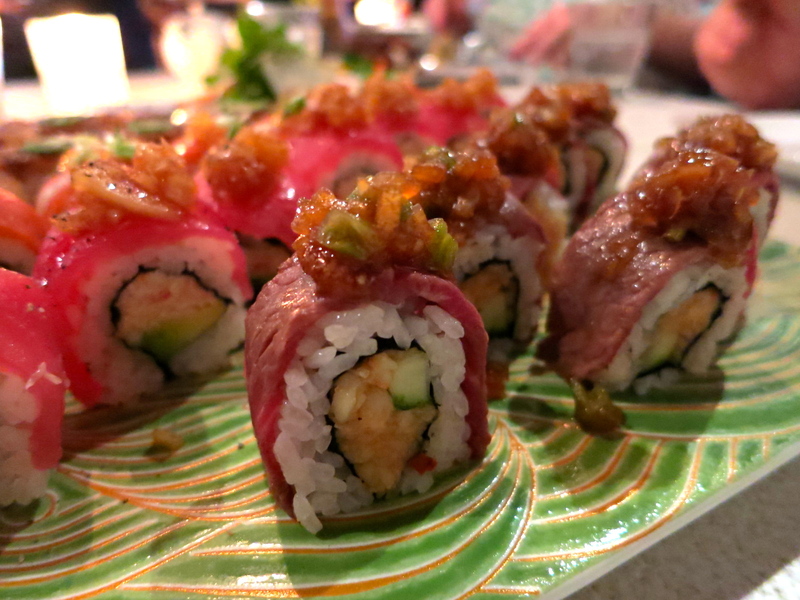 The Minami roll ($16) is filled with spicy prawns and cucumbers and is topped with aburi short ribs and a wasabi masatake sauce. The beef was an interesting element to the sushi and this would be a good roll for someone who isn’t crazy about seafood. The wasabi sauce was very prominent, so if you don’t like wasabi you may not like this roll. The red wave roll ($15) is filled with crab and avocado and is wrapped in red tuna and masatake sauce. This roll was my clear-cut favourite. There is something about red tuna that I just go crazy for. I find it has a much nicer texture than white tuna and a smoother flavour. 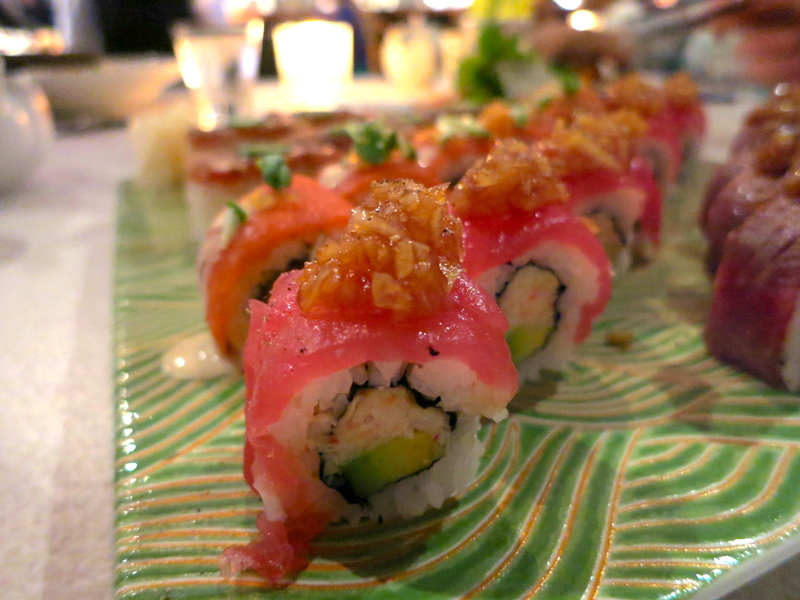 The tuna combined with the sweet crab and creamy avocado filling was a perfect match. I would highly recommend ordering this roll. 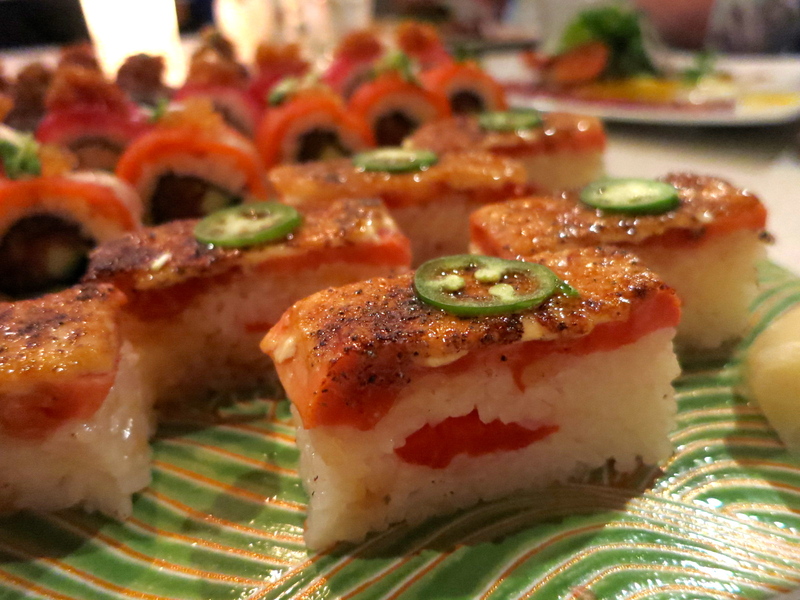 The aburi salmon oshi sushi ($15) is one of their signature items that everyone must order when they come here. It is a block of rice with pressed salmon, jalapeño and Miku sauce. This really is a perfectly executed item. I’ve had pressed sushi rolls at other restaurants, but none of them compare to this. The rice here is lightly packed so it is fluffy and not too dense and chewy. The torched salmon is buttery smooth and delicate. The jalapeño adds a pop of spice and I don’t know exactly what the Miku sauce is, but is it very tasty. 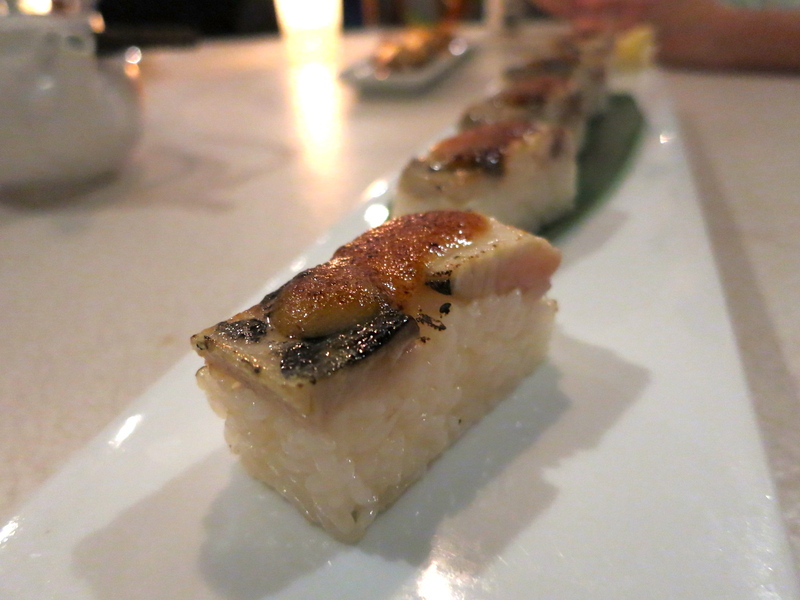 The aburi saba oshi sushi ($15) is made with pressed mackerel and a Miku miso sauce. 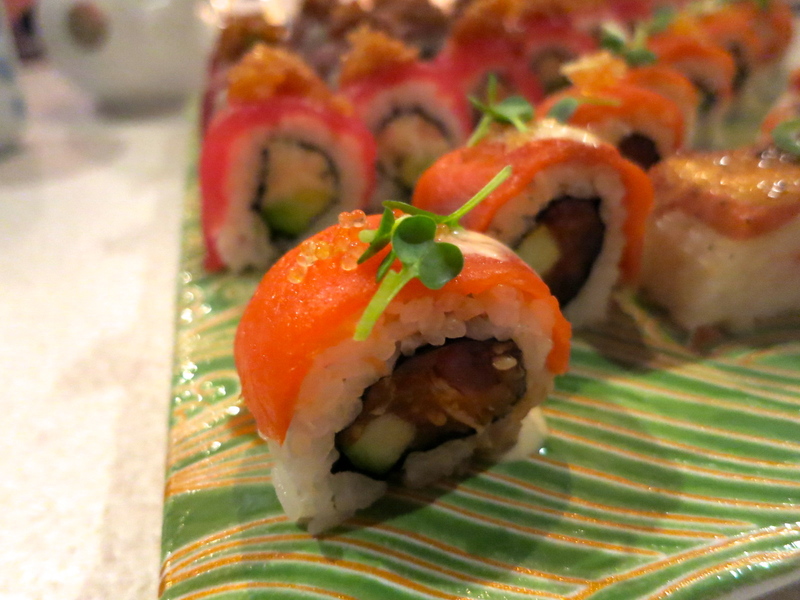 I didn’t think this one would compare to the salmon oshi sushi, it was also delicious. The mackerel had a very distinct smokey flavour that I really enjoyed. The Miku miso sauce gave it a savoury, earthy flavour. Even though it is made in a similar style to the salmon, it has a very different flavour and I would recommend trying both. 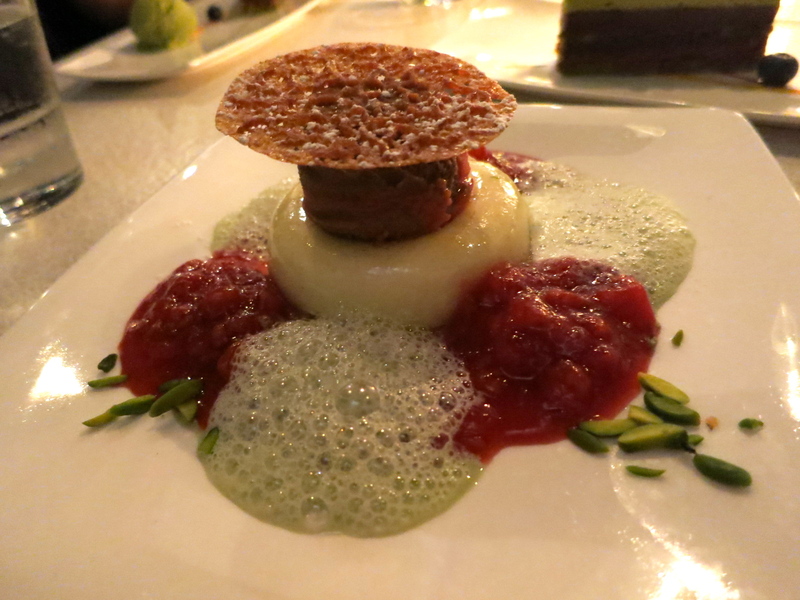 The strawberry chiboust ($12) dessert was made with a mascarpone lime chiboust, strawberry compote, pate brise, strawberry juniper sauce, pistachio foam, and balsamic and strawberry marble ice cream. I didn’t actually try this dessert, but my brother loved it. Our server recommended this if you wanted a lighter dessert. The warm valrhona chocolate fondant ($11) is made with a molten matcha ganache, crystallized jasmine tea, genmai tea tuile, chocolate sauce, and jasmine tea ice cream. This dessert was warm and very chocolately and had a fragrant tea aroma. The jasmine ice cream had a lovely flavour and I would love to eat just a big bowl of that (I believe you can get just a bowl of ice cream). 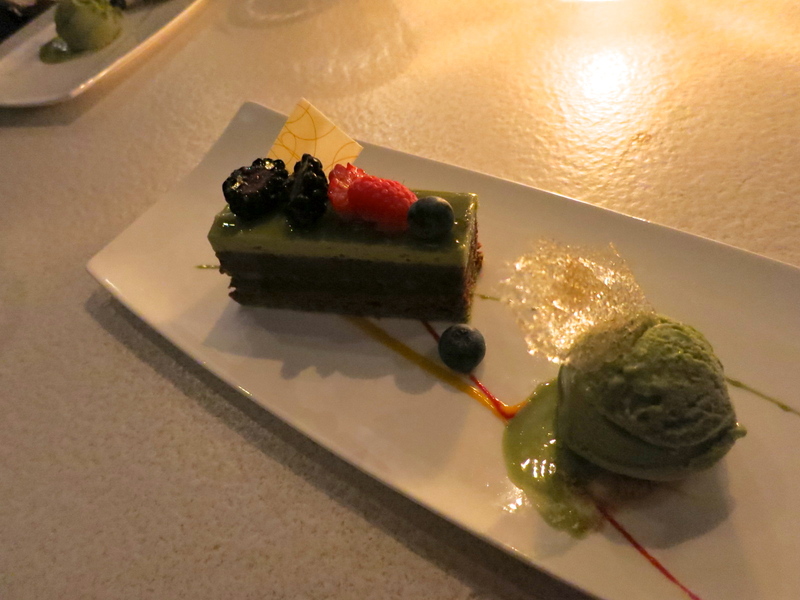 The green tea opera ($11) is their signature dessert and it is easy to see why. This cake is dessert perfection. 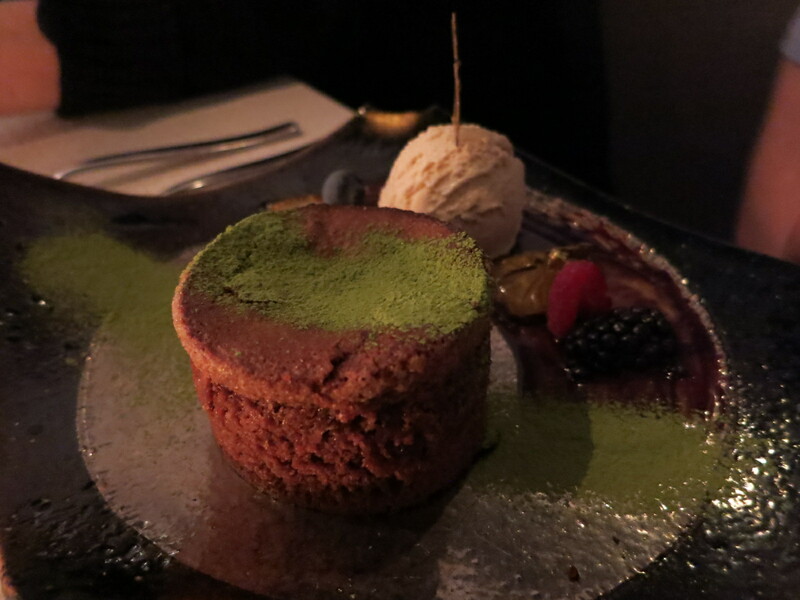 It is made with green tea génois infused with espresso and Frangelico liqueur, dark chocolate ganache, azuki bean purée, and green tea ice cream. This dessert has the perfect balance of flavours. It has rich dark chocolate and hazelnut notes, a bit of sweetness from the fresh berries, and a hint of earthy bitter flavour from the green tea. It also had a good combination of smooth and crunchy textures. This is one of the best desserts I’ve ever had and even if you aren’t normally a dessert person, I think this dish could convert you. It is full of so many different flavours and none of them overwhelm each other. I fell in love with Minami and they gave me a birthday dinner fit for a queen. It is a great restaurant for special occasions because the food is so pretty and it is plated elegantly. You will pay big money for it, but the whole experience including ambiance and service was excellent. If you prefer basic simple sushi, you probably shouldn’t come here, but I think they do really cool and unique things with their food. Yes, for beautiful aburi sushi.